Shenandoah guitars were produced from 1983 to 1996. To my knowledge those assembled in the US (1993 and earlier) had solid spruce tops, laminated back/sides and finished with lacquer. Nato wood necks were common, as well as rosewood fingerboards and bridges which were stained black to look like ebony. Again, these are generalities and may not apply to every single one produced. In an attempt to offer lower priced instruments, Martin's line of Shenandoah guitars were built in Japan and then shipped back to the Martin factory in Nazareth PA for painting and final assembly. The practice of bi-continental production eventually met it's demise and Shenandoah's were produced entirely in Japan their final 3 years from 1994-1996. Shenandoah guitars were usually given the model number of the Martin guitar they resembled, superseded by the number 32. For instance, the Shenandoah D-1832, is a D-18 copy, the D-2832, a D-28 copy and so on. There were other lesser known models as well. The D-6032 which was made using Birdseye maple, the D-6732 which was Quilted Ash. Steel string, classical nylon string and 12 string Shenandoah's were available. Similar to their Martin counterparts, style numbers often denote materials or the "ornate-ness" of an instrument...the higher the number the more jewelry the girls got on. Shenandoah guitars can be dated by the 6 digit serial number stamped on the neck block inside of the instrument. These numbers correspond with Martin's standard serial number listing which applies to Martin guitars as well. See list of Martin serial numbers here. 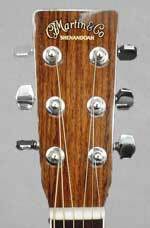 Martin Shenandoah's are subject to the same warranty guidelines as other Martin guitars. I have written an article which details sources for determining instrument's value here. You may also wish to consult guitar price guides or Blue Books.